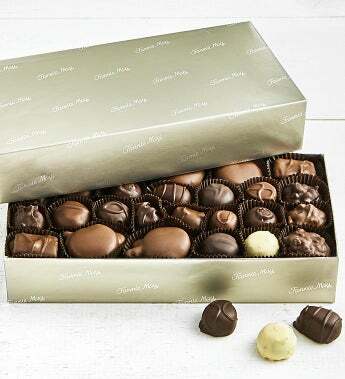 This best-selling chocolate assortment is a virtual 'Best of Fannie May'. Featuring a treasure trove of goodies that are sure to please everyone. This is a perfect treat, no matter what kind of confectionary delight you're craving. The Colonial box caters to all chocolate fans, featuring a wonderful milk and dark chocolate assortment. If it is variety you crave, the Colonial Assortment will surely impress. Coated in milk and dark chocolate, these pieces include toffees, Pixies, Trinidads, buttercreams, crunchy nut clusters and more. Kosher OU-D. This best-selling chocolate assortment is a virtual 'Best of Fannie May'. Featuring a treasure trove of goodies that are sure to please everyone. This is a perfect treat, no matter what kind of confectionary delight you're craving. The Colonial box caters to all chocolate fans, featuring a wonderful milk and dark chocolate assortment. If it is variety you crave, the Colonial Assortment will surely impress. Coated in milk and dark chocolate, these pieces include toffees, Pixies, Trinidads, buttercreams, crunchy nut clusters and more.